In a microwave safe bowl melt the white chocolate melts in the microwave, warming at 30 second intervals until smooth and creamy. In a separate bowl, beat pasteurized egg whites with sifted powdered sugar. Scraping sides of bowl often. Beat in vanilla, lemon extract and salt. Gradually add butter and beat well. Make a well in the center of the buttercream and pour in the melted white chocolate being careful not to get any on the sides of the bowl. Whip on high for 1-2 minutes or until white and fluffy. Mix on low to eliminate any air bubbles. This can be stored in the refrigerator for a couple of weeks or frozen for up to two months. Always bring to room temperature before using and whip up to reach original consistency. Makes about 3 lbs of buttercream. I use this icing all my cakes. It is a good versatile icing for sculpting to your basic cake shape. It is very smooth and works well in a piping bag. It also taste so amazing! Thanks to Christy Duffell-Seguin of Cake Rocks in Austin, Texas for this great recipe!!! White Chocolate Buttercream my Ultimate Favorite! In a microwave safe bowl melt the white chocolate melts in the microwave, warming at 30 second intervals until smooth and creamy. In a separate bowl, beat pasteurized egg whites with sifted powdered sugar. Scraping sides of bowl often. Beat in vanilla, lemon extract and salt. Gradually add butter and beat well. 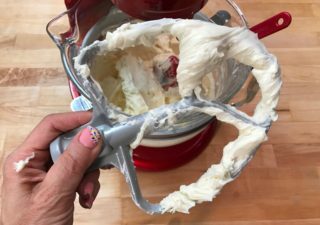 Make a well in the center of the buttercream and pour in the melted white chocolate being careful not to get any on the sides of the bowl. Whip on high for 1-2 minutes or until white and fluffy. Mix on low to eliminate any air bubbles. This can be stored in the refrigerator for a couple of weeks or frozen for up to two months. Always bring to room temperature before using and whip up to reach original consistency. Makes about 3 lbs of buttercream.